This article and infographic by Tricia Morris succinctly describes why the social customer deserves your attention. I know social customer service has value but I’ve struggled to come up with a consistent and ongoing metric that frames our social customer service program’s ROI in monetary terms. But I finally had my “Aha!” moment this week during a #PDXchat discussion, “What’s The Real ROI of Social Media”. One of the lead facilitators, Terry Starbucker, recommended that we do two things: first, know the financial value of your customers; and then tie Social Media ROI to profit, sales or customer retention. And that got me thinking………. One important measure that I use is “Ranter to Raver” which is modeled on a metric that Dell tracks in their Social Media program. It’s a great way to quantify how many unhappy customers you have turned around into brand champions. Like Dell does, I have been calculating this solely on a percentage basis: Ranters turned into Ravers/Ranters. Which is all good but it doesn’t convey our success in dollars & cents. So when Terry advised us to frame ROI using the financial value of our customers tied with customer retention, the light bulb went off in my head! I finally have a way to calculate ongoing ROI for our social customer service program. I know what the financial value is for each Cancel/Save customer. All I need to do now is take that financial value and apply it to the number of Ranters-to-Ravers. Voila! I can now produce an ROI figure for our social customer service efforts. MYTH: “The customer is always right”. TRUTH: The customer is not always right. They are (at times) wrong, wrong wrong! I keep this second truth in mind when I am negotiating, re-setting expectations, and resolving issues. Treat your customers with respect, listen to them, and manage their expectations. They may not always be right, but they are always the customer! I read an insightful post by Alice Wright on customer surveys. Her main point was how focusing on customer survey results can get in the way of providing excellent service. I’ve often found myself in similar situations – especially in retail environments – where the person who rang me up practically begged me to give him/her the highest rating. Whenever this happens (I’m looking at you big-box retailer! ), I typically think, “Um, no, I will not take the survey because you didn’t provide me with any service. You just rang up my order”. Ringing up my order is a transaction, it is not customer service. Too many people confuse transaction assistance with customer service – they are not the same animal. If you offer me something unexpected, or give me a cool tip on a product or service, that’s a different story. Now you have provided me with service (along with my transaction). As a result, I am more inclined to take the survey AND give high marks. Maybe we should rename some “customer service” positions and call them “transaction assistance” positions. Perhaps that will lessen the confusion of what customer service truly is. It’s not a transaction, it is about providing a memorable experience! I came across a chart in Information Week’s article, “How To Get From CRM To Social” that blew me away. As in “OMG, you have got to be kidding me” blown away. On Feb 22, 2012, Twitter hit 500 million users. With a world population of 7 billion people, approximately 1 in 14 people have a Twitter account. 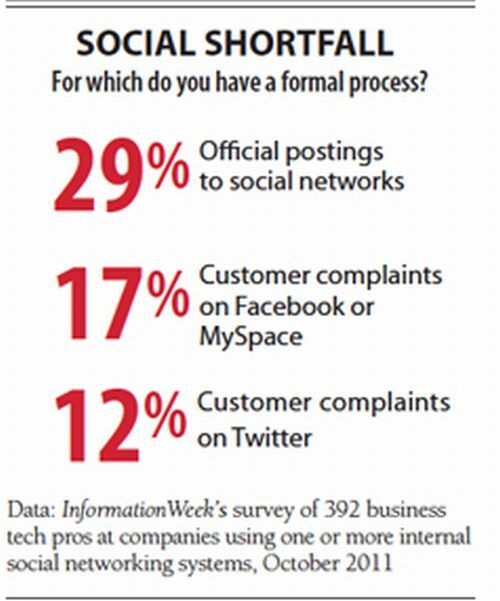 Yet, only 12% of businesses in this survey have a formal process for responding to customer complaints on Twitter. With the number of Facebook users projected to hit 1 billion this year, approximately 1 in 7 people will use Facebook. But only 17% (approx 1 in 6) businesses surveyed are ready to respond to their customers. Want to build customer loyalty? Adding a personal touch will provide your customers with “memorable experiences” and make them feel special. Convenience sells. Convenience brings in new customers. Convenience keeps customers coming back for more. Walgreens’ mobile app is a great example of how technology can improve the customer experience. Available for iPhone, Android, and Blackberry, this handy app epitomizes convenience. Need to refill your prescription? Simply use your phone’s camera to scan the bar code and send in your order. Want to know when your prescription is ready for pick-up? No problem-o, just sign up for text alerts. Have to order photo prints? Piece of cake! Simple, easy-to-use, convenient – a winning combination! Social Customer Service – What are the Metrics? There are plenty of articles on how to measure the effectiveness of Social Media Marketing efforts. But Social Customer Service is a different animal and needs other metrics to gauge its effectiveness and impact. It’s a tough question to answer because Social Media ROI is not always easily broken out in dollars & cents. What’s the cost of a complaint that goes unanswered? What’s the revenue impact of a positive mention? I spent a good chunk of time investigating this question from a customer service perspective. In the end, I think the best answer comes from Frank Eliason, the man who started Comcast’s Social Media customer service program, Comcastcares. See if you agree with how Frank answers the ROI question – I do! You have two choices: either join the conversation or ignore it. I am convinced that it’s better to participate than hang out on the sidelines. This point is driven home by a customer service presentation given by Christine Timmins Barry, Senior Vice President, Global Operations, Convergys.